Overcome fears and phobias when you listen to this superb high quality hypnosis CD by Glenn Harrold. Overcoming all types of phobia and anxiety including the fear of heights, the dentist, sickness, agoraphobia, claustrophobia, spiders, needles, snakes, social phobia and anxiety and more. Hypnotherapy can help you to develop lasting solutions that will help you in many areas of your life. 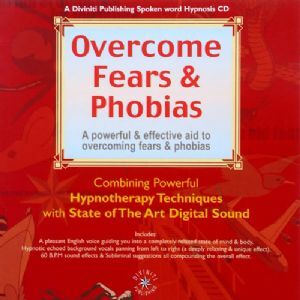 On the CD there are techniques that will help you to overcome any phobia or anxiety problem in a safe and natural way, free of any harmful side effects. This recording has been very carefully scripted and constructed with the sole aim of being as effective as possible. Glenn Harrold has drawn upon his wide experience as a clinical hypnotherapist who has helped many clients overcome a wide range of common and obscure fears and phobias. The CD features two 27 minute hypnotherapy sessions. On both tracks you will hear a pleasant voice guiding you into a deep state of mental and physical relaxation. Hypnotic echoed background vocals pan from left to right across the stereo range. This deeply relaxing and unique effect will help you to relax further into the hypnotic trance state. You will also hear some 60 B.P.M digital sound effects and powerful subliminal suggestions that compound the therapeutic effect, leaving you to experience deep relaxation and stress relief. Glenn Harrold is an author, musician and experienced clinical hypnotherapist who has helped thousands of clients over a wide range of stress related problems. He has combined his hypnotherapy skills with an extensive recording knowledge to produce a uniquely effective series of high quality hypnosis recordings that have sold over 500,000 and are well established as the UK's best selling self-help CDs of all time. Glenn also writes self-help books for Orion in the UK and McGraw Hill in the USA and produces hypnotherapy CDs for BBC audiobooks and his own company Diviniti Publishing Ltd. Glenn’s best selling hypnosis CD, Complete Relaxation, has been at Number 1 in the self-help audio chart every year for the last 7 years, and in 2006 was awarded a gold disk for sales of over £250,000. Glenn’s has over 15 years of experience as a clinical hypnotherapist in one to one therapy sessions, and in recent years he has worked with many high profile and celebrity clients. He is a full Diplomat member of the BritishSchool of Clinical Hypnosis who are the only hypnotherapy organisation in the UK affiliated with the training of NHS doctors and other health professionals in the art of hypnotherapy.